I haven’t posted anything in the Easy Entrees category in a while, so here’s a new one. 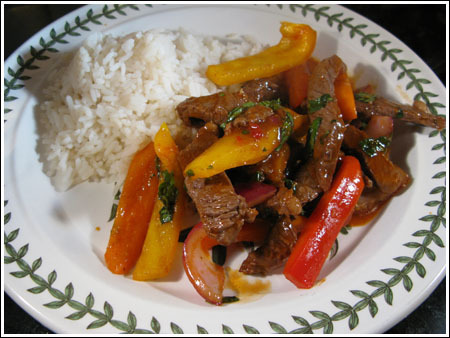 I found this on the Taste of Thai website and I do believe it’s my new favorite stir-fry. I made it this evening for Todd and Emma and they both loved it because it wasn’t too spicy, but had a lot of Thai flavor. It was also pretty and fun to make! To make slicing the sirloin easier, I stuck it in the freezer for about an hour then cut it on the diagonal. The recipe doesn’t say how long it takes to cook the meat, but if you are wondering, mine took 3 minutes. Here’s a link to the recipe and a photo of what mine looked like. Next time, I might try it with vegetarian beef strips. Hi Jana! Thanks for the review. I just checked the brand curry paste I used and it was Thai Kitchen. It came in a jar — not the little packet that Taste of Thai comes in. So maybe Thai Kitchen’s curry paste isn’t as hot. Good to know! I’ll have to try it again with Taste of Thai brand, but I’ve had trouble finding their red curry paste. I tried this recipe last night. The flavor was great but I disagree with the spicy part. My family thought is was quite spicy and we even like spicy food. I would maybe cut down on the curry next time. Thai flavours are right up there in my top 3 and this dish looks absolutely wonderful. I’ll bet it would be good with chicken too. Really really yummy looking. Mmhmmn! Your photo looks so much better tasting than the one from the original recipe posting on the Thai website! Absolutely one of our favorites. The meat is so much easier to slice properly that way. This loks yummy – nice and quick too.